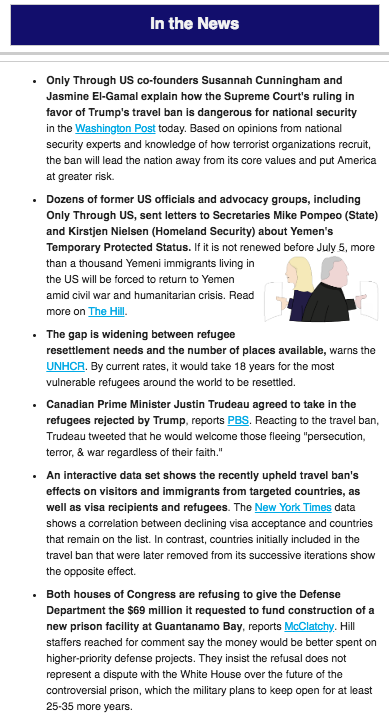 The Weekly Briefing is a digest of news, policy updates, events, and other information relevant to Only Through US' work protecting American principles and freedoms against fear-based reactionary politics that follow in the wake of terror attacks. To support our efforts or connect and learn more, subscribe to our briefing emails or contact us at info@onlythroughus.org. 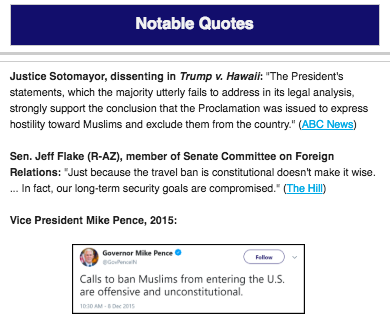 Briefings include updates and news on religious inclusion, the refugee program, the prevalence of law and order efforts to close Guantanamo Bay, to confirm America's commitment to end torture, and to make America safe and inclusive for all Americans.